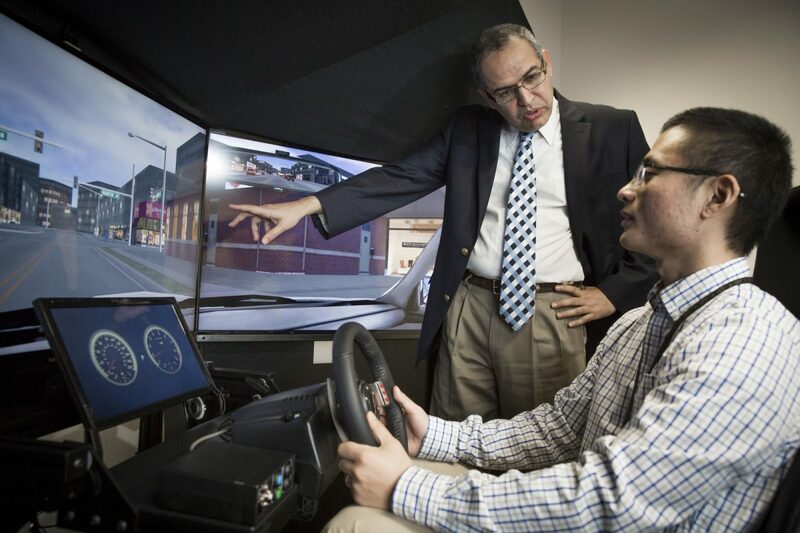 A team of UCF researchers has become a finalist with Ford Motor Co. in a national competition to improve traffic safety, having beaten out more than 50 other teams in the competition. The UCF entry, Real-Time Crash Visualization Tools for Traffic Safety Management, is a computer program that uses big data to predict — and hopefully prevent — traffic accidents before they happen. The U.S. Department of Transportation, which sponsors the competition known as the Solving for Safety Visualization Challenge, named the finalists this week. Mohamed Abdel-Aty, a Pegasus Professor and chair of UCF’s Department of Civil, Environmental and Construction Engineering, leads the team. Abdel-Aty’s team became a finalist after beating four other teams, including one from Uber, during the semifinals. They had entered the semifinals in December. As a finalist, the team receives part of a $100,000 prize purse and will compete for the final prize, which is a share of $250,000. As it has advanced through the competition, the team has developed its entry from an idea in stage I, to a prototype for the stage II semifinals, and will now develop a fully working version for submission in stage III, the final part of the competition. Using information including real-time traffic data, weather, history of past accidents and violations, and other data, the team’s program predicts if the risk of an accident is increasing or decreasing in a situation and presents the probability in an easy-to-understand visual readout alongside a map overlaid with current traffic-flow conditions. The idea is that if the risk of an accident rises, then transportation officials could implement measures immediately to reduce the risk, such as reduced speeds, metered ramps and messages warning drivers of perilous conditions ahead, says Abdel-Aty. “Reducing risk can reduce the possibility or the severity of an accident,” Abdel-Aty says. There are about 37,000 traffic fatalities per year in the United States and millions of injuries,” Abdel-Aty says. He says the team’s program is designed to make real-time improvements in traffic safety based on rich data and sophisticated algorithms. Seeing different trends and dynamics will allow operators to make better decisions. Abdel-Aty received his doctorate in civil engineering from the University of California, Davis, and his master’s and bachelor’s degrees in civil engineering from Alexandria University. He joined UCF in 1995. The research team was comprised of students and researchers from the College of Engineering and Computer Science, including students Yina Wu, Jinghui Yuan, Morgan Morris, Qing Cai, Yaogang Gong, Ou Zheng, Jacob Lites, Jiajia Dong, Whoibin Chung, Moatz Saad, Lishengsa Yue, Jorge Ugan, Shile Zhang, Zubayer Islam, Md Sharikur Rahman, Md Hasibur Rahman, postdoctoral associates Yina Wu and Qing Cai and professors Samiul Hasan and Jaeyong Lee.